Ten years ago, I was in the middle of playing Morrowind and/or Neverwinter Nights (yes, both released in 2002 but I didn’t pick them up until ~2 years later). I had stopped playing my first and at the time only, MMO, Asheron’s Call, about 3 years prior. I read about a new game coming out, that promised no subscription fee. What the heck, I figured I’d give it a shot. And so I bought Guild Wars, and got around to creating a character 2 or 3 days later. I wasn’t able to play much until months later, it was a hectic time because I moved to another state. 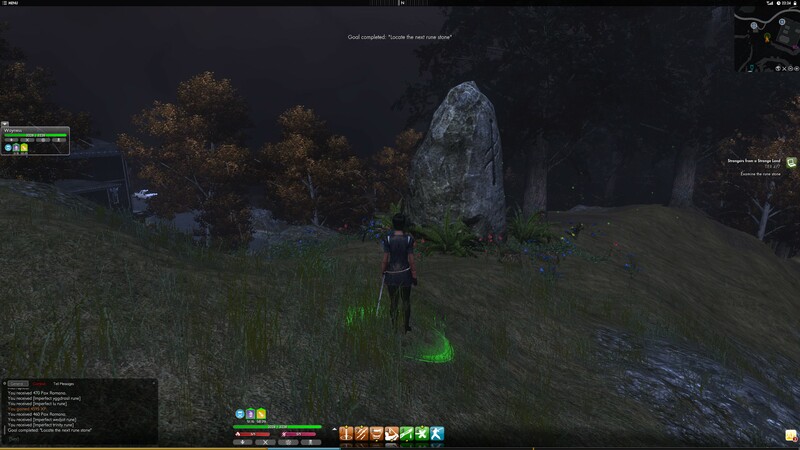 My original day 2 or 3 character was a Ranger/Mesmer I named Dawn Stormborn, but I decided I’d rather have a Ranger/Monk, and not knowing I’d eventually be able to switch secondary professions, I just deleted and recreated the char. That’s why as of when I took the screenshot (yesterday), the /age command shows me as playing 119 months and Dawn being 113 months old. That should flip over to 120 months in another day or two. I played fairly heavy back then – I had more time available. 3318 hours total and 1266 on Dawn! That was accumulated over about 2.5 years so I was averaging nearly 10 hours a week just playing Dawn and nearly 25 playing Guild Wars. I loved it all. I loved the missions, the bonuses to the missions, the skill system with limited space plus and optional elite skill, the storylines, capturing elite skills, fast travel to outposts after reaching them the first time, no permanent death penalty (clear vitae by getting to an outpost), henchmen, heroes, instanced zones, the guilds I was in, grouping with guildies to do missions even though at a certain point I basically had them memorized, grouping with the “Zoo Crew” on some Saturday afternoons to play through content as beastmasters, Prophecies quests that granted skills, etc. Good times. For Dawn, I did all that plus the Guardian titles (i.e. missions and bonuses in hard mode). I did most with heroes and henchmen, with a few exceptions such as Aurora Glade, Thirsty River, Eternal Grove, and Gate of Madness, where I grouped with guildies and friends. 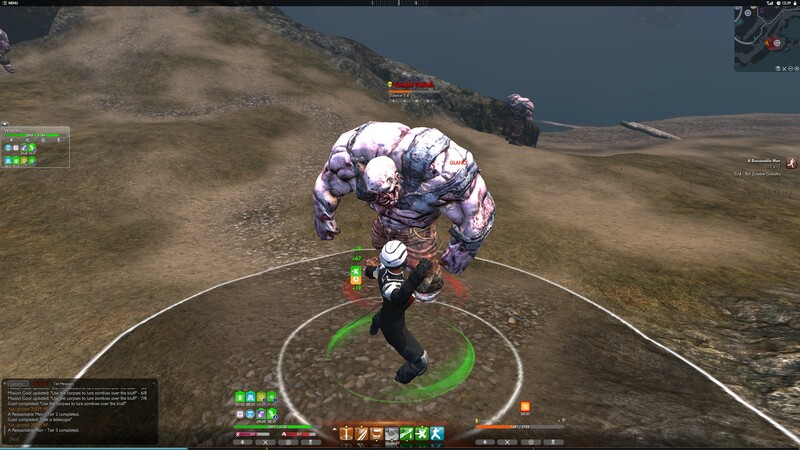 Some of my most vivid memories of MMO gaming, even 7-8 years later, were doing those missions for Guardian titles, controlling my heroes and henchmen, determined to finish. I enjoyed the elite skill capture mechanism, and decided early on to capture every elite on Dawn. Thus, when the official Skill Hunter track was introduced to the game, I was well on the way to finishing. I made an attempt to do cartography but that was too dull for me, wall hugging every zone. I started on Vanquisher but got tired of that as well. I really just wanted to get the Guardian and Skill Hunter titles, and wound up with 13 max titles putting Dawn in the “People Know Me” meta-title, 2 short of the next one. By time time EoTN rolled around, and the bonus mission pack, I was getting a little burned out. I only took 2 characters all the way through EoTN – my ranger Dawn and my mesmer Rhaella. I think I brought another char or two in there but never finished the final mission. Or maybe I did on one of them. 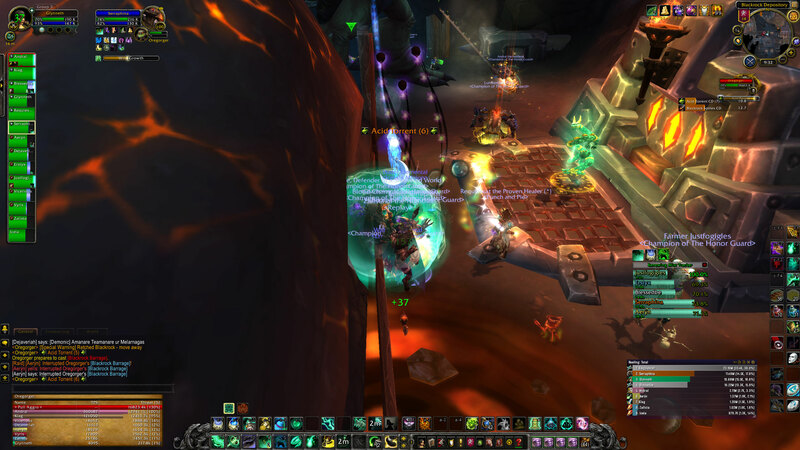 I did not get into PvP much… until Factions released and brought Alliance Battle. I rolled up a few PvP chars and played that fairly often, it was just fun. That’s the only type of PvP I actually enjoy – I hate open world PvP, vastly preferring the instanced battleground-style version. 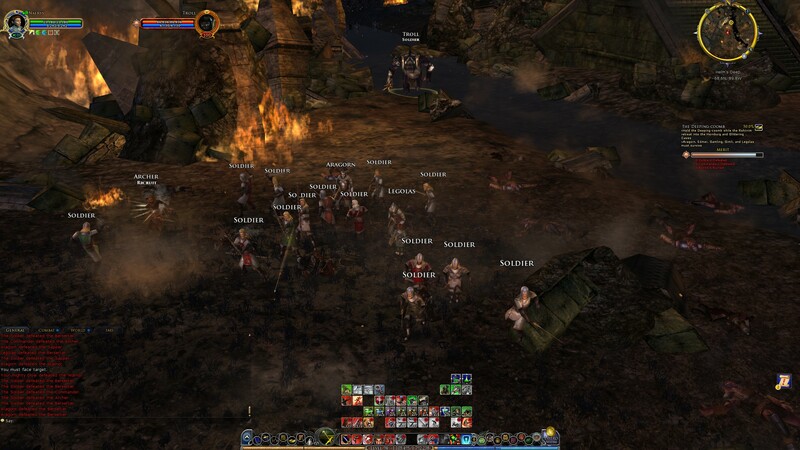 People talk about how you always fondly remember your first MMO. 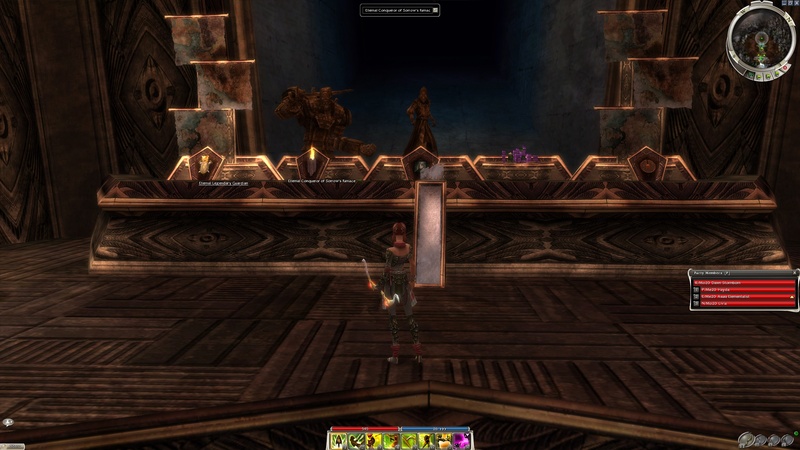 For me that mystical game on a pedestal was actually my second MMO! 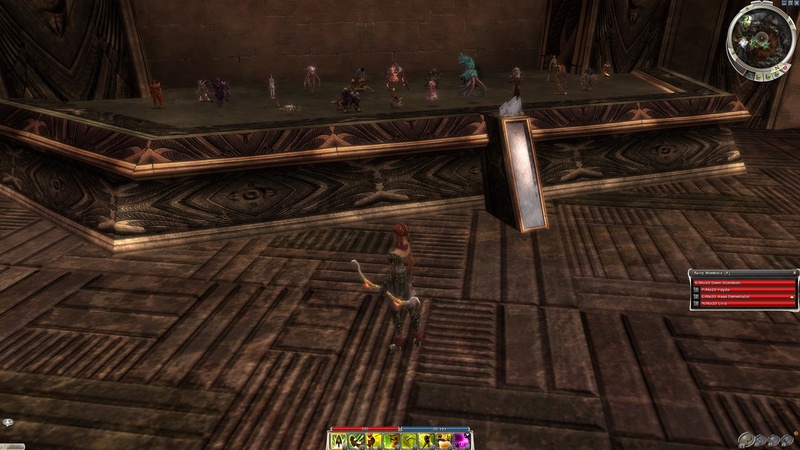 I had fun in Asheron’s Call but Guild Wars totally buried it (for me) in every way. GW overshadows GW2 such that I can’t seem to stick with its sequel. EDIT: I should have included a visit to my Hall of Monuments! Giant-size versions of my favorite armors. Steam tells me I’ve played 89 hours of The Secret World, and I’m finally ready for the Blue Mountain zone. I’ve done every mission I can find in Solomon Island (not so sure about Kingsmouth but I’m also too lazy to backtrack just for completion) and I only skipped one that I know of (Hell and Bach). Nearly all my gear is QL5; I think only a minor pendant isn’t. I’m at tier 12 of Dawning of an Endless Night, and also have the Stranger in a Strange Land mission. Both of these take place in Blue Mountain. I already did the one mission where you drop some dogtags off at an outpost in Blue Mountain, after exploring a cave, but that just finished there. It’s a quest that leads you to the next zone, not one that takes place in that zone. Now, it really is time to move forward! So two comments about how fighting proceeds, for me at least, in the Secret World. I’ve read the criticism that combat is a bit dull, and I can see where that comes from. The way builders and consumers work, many fights come down to 5 X builder, 2 X consumer, toss in a few utility skills when needed. So in the respect, it is a bit repetitive. However, after adding in dodging and mobility, it is better than planting yourself and hitting 1,1,1,1,1,2,3. It becomes more active: far more than WoW, a bit less than WildStar, around the same as a slowed down fight in GW2. After considering the skill system – I can train all weapons and skills, change my role by swapping weapons – I’m really enjoying it overall. Since consumer skills are more effective with more resources, I find myself staring at the small weapon resource area during fights. Or glancing frequently, and often catching the rest of the action in my peripheral vision. It is handy that a boss AoE charging circle is easily noticeable in the background. I’ve been playing so much (relatively speaking) TSW lately because it fits my schedule very well. 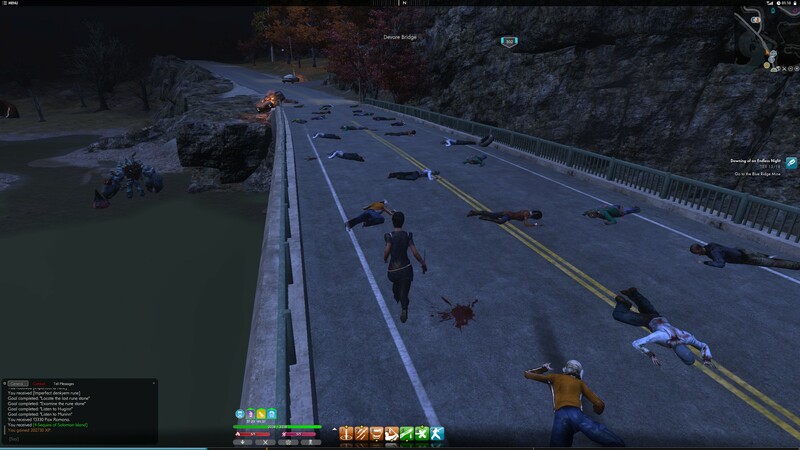 Many days I just have an hour or a bit more to play, and that’s enough time to finish a mission or 3 in TSW. Also, I’m a Grandmaster which gives me an xp-boost potion every day, and it lasts for an hour. The timing is good. 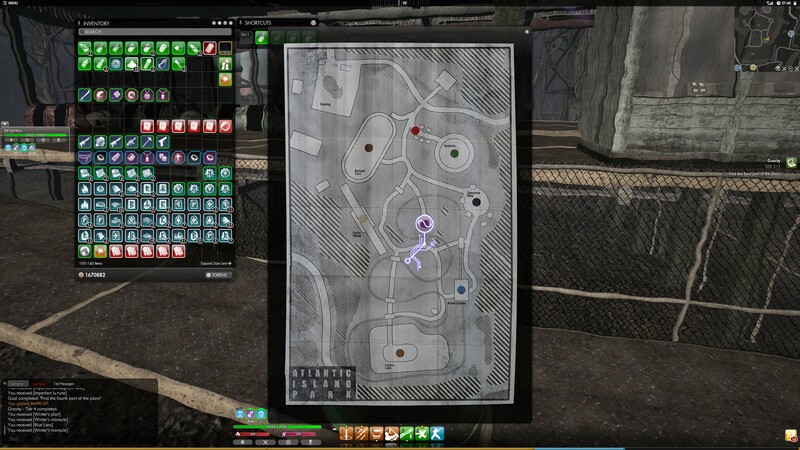 The Secret World has memorable investigative missions, ones that involve tricky puzzle solving. In Kingsmouth, one that stood out to me was Dead Air, which involved listening to a morse code tranmission and decoding it for the coords to the next stage. In the Savage Coast, the investigative mission that stands out for me is Gravity, which has you use a lens to read a map. I didn’t solve Dead Air on my own, I got stuck on the decode and looked up the correct answer. Similarly, I was stuck on Gravity so I peeked… and when I saw how to continue, I was able to get the rest. All the same, both puzzles were awesome. In Gravity, you start with a will and a lens. It is straightforward to use the lens and get a special buff that lets you read hidden text in the will. Follow the directions and soon enough you are at the next step… but stuck. There is some broken glass at the end of the trail but what to do? I fiddled around but didn’t get it, and eventually looked it up. The answer (spoilers ahead) is to craft the tool for the next step. Yes, crafting as a way to solve a mission, not just make gear, or as it is in so many games, craft items straight into the trash just to bump your crafting skill higher. To continue I had to open the regular crafting menu, and add the lens and the broken glass together to get a red lens. At the end of the next stage, there was blue broken glass laying nearby… but I knew what to do from the previous step. The next step didn’t have any broken glass, but I took a guess and use both red and blue to craft a purple lens, which let me continue. I just loved it. Crafting actually used for good purpose for a puzzle oriented quest! The closest quest similar to this, in recent memory, is from Skyrim where you had to examine the Golden Claw closely to dial the correct combination for a door – but that didn’t involve any crafting. Without the hint – the TSWDB site if fantastic, all of their mission walkthroughs are excellent – I don’t think I would have come up with crafting as the way forward. I think this game sets the bar for great quests, and I’m only two zones into the game. Yes, I’ve been dallying and there was a solid year I didn’t play it, but now I’ve gotten back into the game and am really enjoying myself. The combo of the new player revamps, a better build I found on the forums, and better quality gear (mostly QL4 and 5 at this point) has made it far more enjoyable than before. Thanks to the recent Golden Weekend, I earned enough ability points to finish the Blade/Fist progression deck. The chief benefit of the weekend was gaining an additional ability point whenever receiving one… to maximize ability points I also bought a potion from the store which did the same thing, since it stacked. I’d like to fiddle around with builds and skill combos, but having a “known good” deck to fall back on is important to me – if I find out something isn’t working then I can return to my good deck while earning ability points to unlock other skills. One thing to keep in mind is the important of AoE damage. I find myself fighting 3-4 mobs all the time, except for bigger tougher mobs and even then, moving the wrong way might aggro a second one. I’ve done most of the quests in Savage Coast, and will now focus on advancing in the storyline. I inched forward slightly to step 11/18 by visiting the Innsmouth Academy during another quest, and speaking to the staff trapped there. I’ve been able to upgrade my weapons as well, to the QL5 versions sold by the vendors in the NW corner. I’d like to branch out into other weapons as well (I’ve spent a few skill points in Chaos and Blood too) and that will take more skill points. Every time I look at the skill chart and ability wheel I feel like I have barely unlocked anything… I remind myself I’m only in the 2nd zone so yeah, that’s expected. After all, ability and skill points replace levels in this game. I’d be the equivalent of a low level char in the 1st or 2nd racial areas in GW2, still unlocking all the skills of various weapons. From reading various forums I see that eventually there are plenty of skill points and ability points to unlock the whole thing. I’m just impatient, haha. Soon I’ll advance to the next zone, Blue Mountain! OK, I’m getting the hang of these Epic Battles. My goal isn’t to fight every single mob that streams in, my goal is to make sure the commanders have current orders (heal if available, sometimes armor if available; otherwise default) and basically ignore all the regular/white mobs. I’m better served by tabbing through and only helping with the orange/elite mobs. The white die by the time I get one attack in. Where the orange ones can inflict major damage to my troops if left unchecked. So I just parked myself in a convenient spot, and issued various Guardian taunts and challenges to ensure the orange/elite mobs came after me first. I’d get part of my rotation in and with the help of the NPC focus fire, they would die quickly enough. And that’s how I got through the Deeping-Coomb battle on my first attempt. It isn’t exactly the heroic feeling, ignoring 80% of the incoming enemies, but the NPCs can handle those while I concentrate on the threats to victory. In some ways, I suppose it does have a movie battle-scene feel, where the heroes wander around mowing down the grunts and have a big fight against the leaders in the opposition – while the rest of the battle rages around them. All the same I’ll be glad to finish up Vol 3 Book 13 and move onto Gondor (after confronting Saruman). 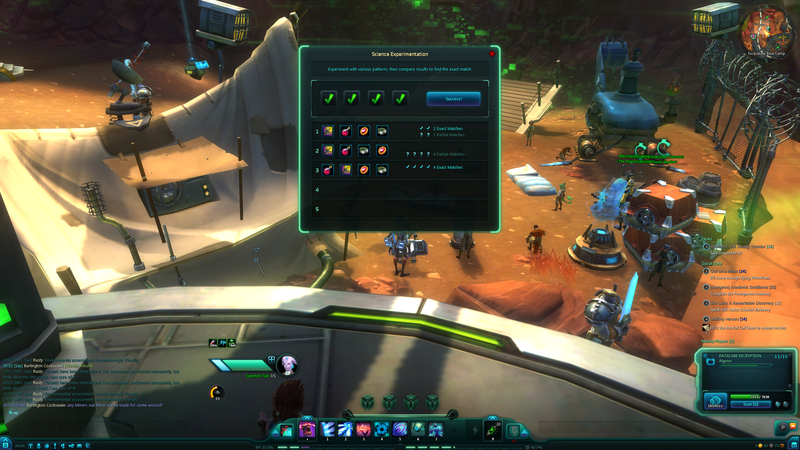 WildStar has typical quest hubs, but those don’t generally have too many quests available when you first show up. That’s because the game gives you more as you complete them, even if you are out in the field adventuring. After all, this is a sci-fi game and the quest giver just calls you up on your communicator (hotkey ‘C’) and lets you complete a quest and get another one. Guild Wars 2 is similar in that you usually don’t have to return to the quest giver after heart completion – it just lets you finish right there in the middle of the landscape. 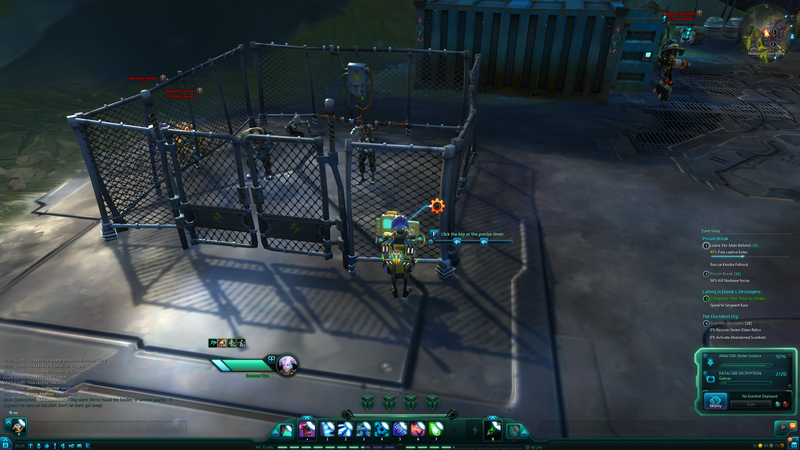 So in WildStar, a quest will have you investigate a prison camp (for example, I just did this chain in Galeras!) and that leads into a prison break, which leads to sabotage and an option to poison the air supply and assassinate the prison warden. Not too revolutionary that you naturally continue without returning to some fixed location. It isn’t too difficult to pull off, but I can also imagine higher level or more difficult scenarios where the active region is tiny and the slider moves very fast! I’ve also seen some enemy skills that stun me, and I’ll get a brief message about holding or tapping a key to break it faster. Unfortunately, I haven’t been fast enough to get a screenshot of that. In this example, I was lucky with my first two guesses so I solved it in 3 moves. 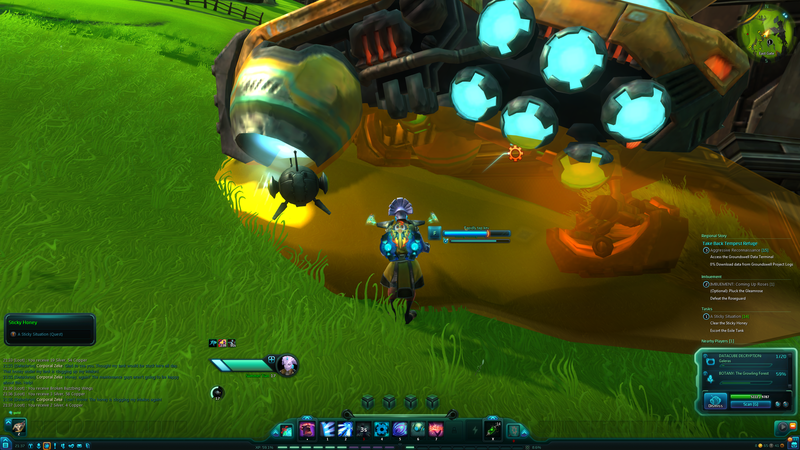 Anyway, I am still enjoying WildStar very much!